In August 2016, Duo attempted to perform the first two-factor authentication from space by launching a weather balloon armed with a satellite phone, a Raspberry Pi, a cellphone and an articulated astronaut finger. Crew streaming live from the Desert. We knew from the beginning of Duo in Space that we wanted to help document the project with a compelling, engaging video. With plans to launch it during DEF CON, the hacker convention in Las Vegas, we were looking for a way to actively engage the local audience during the event. Live streaming a multiple-hour event that called for preparation, launch and recovery through the Nevada desert presented many potentially disastrous challenges and uncertainties. But the risks of failure and showing our flaws to a live audience outweighed the positive opportunities, so we decided to take a chance. Multiple social media platforms are designed for video sharing and live streaming. We looked into several of them — free options like Periscope, Facebook Live and YouTube Live, as well as paid, dedicated live stream providers like Livestream and Ustream. No single solution was perfect, and each came with its own limitations. One of the most important requirements for us was the ability to embed the video directly on our Duo in Space webpage and easily share the content on several social media platforms. This ruled out Periscope and Facebook Live; they only work well on their own platforms. While you can embed a Facebook Live video on a webpage, the square format and lack of third-party software support for streaming were deal breakers. A professional platform like Livestream called for too much proprietary software and hardware needs for our liking. Their product is geared toward more high-end productions and didn't suit our needs well; after all, we’d be run-and-gun shooting out in the desert. Ustream, while more affordable and more compatible with third-party software, didn't provide any real advantage over YouTube Live in terms of features and support. YouTube Live was the clear winner, allowing us to easily embed and share our video. Its support for multi-camera streams from various angles impressed us as well. Plus, almost all third party streaming software supports YouTube Live. Furthermore, we’ve been using YouTube Live for a few years with our popular Duo Tech Talks series, and we wanted to test it out in the field. We considered a variety of camera and stream setups, from high-end hardware solutions to simple mobile apps with one-button operations. Using software like Wirecast or Open Broadcaster Softwarein a controlled studio or office environment is great but totally impractical in the middle of the desert. There was no way we could rely on running a laptop powered by a car battery — not to mention the unnecessary additional logistics of creating a local Wi-Fi network to communicate with the roving camera while also streaming via LTE. This problem piqued our interest in the VidiU Pro. Allowing for easy encoding and transmission via 4G LTE or Wi-Fi via a simple hardware box, you simply plug it into your camera via HDMI and go. However, the 75 minutes of battery life and $1,000 price tag turned us off. It became pretty clear that a mobile phone solution might be the simplest and most effective way. Smartphones are basically computers with high-speed internet and a built-in camera, so why reinvent the wheel? Both Wirecast and Teradek offer mobile solutions for live streaming. The Telestream Wirecast Go app was simple and easy, but its advanced features were limited. 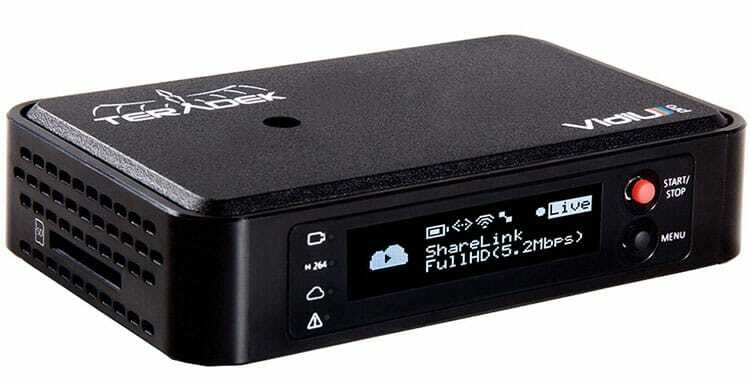 Instead, Teradek’s Live:Air Solo mobile software — which had controls like white balance, audio monitoring, multi-camera switching, graphic overlays and custom bit-rate limiting — won out. Better yet, it supports multiple streaming platforms right out of the box. Knowing that we might be streaming for up to eight hours, we had to be mindful not to exceed the data limit on our prepaid plan. The advanced bit rate limiting options in Live:Air ensured we wouldn’t cross our 1GB/hour threshold while also keeping the feed running smoothly when the LTE signal was weak. Thanks to Verizon's surprisingly robust coverage in the Mojave Desert, we only lost our connection twice for just a few minutes. This totally shattered our expectations of relying on a single LTE connection for live streaming. We knew the onboard audio would be poor quality, and it would be awkward and tiring to hold a phone for hours. The Beastgrip kit with lens and mic was the perfect solution, giving us great two-hand control over the rig and allowing us to mount a monopod on the bottom for one-hand operation and boom pole shots. In addition, the extra wide angle lens helped us compose great shots in confined car spaces and gave some nice, crisp macro shots of our space rig. The RØDE VideoMicro was the perfect fit for the Beastgrip and sounded great compared to the iPhone's subpar omnidirectional onboard mic that’s optimized for phone calls rather than video production. And while the iPhone battery life is good, running the screen and encoding video for hours takes a heavy toll. Thanks to a portable phone charger, however, we were able to keep the battery alive for more than five hours with room to spare. With a good smartphone and a few professional accessories, we were able to broadcast our story in real time, sharing it with viewers all over the world. But the right tools and apps are only one part of the puzzle; a successful live stream still requires solid content, interesting people and a good story. If you have those components on your side, consider how much you need to produce your video content and whether live streaming might be your best option. Social media is a powerful tool to share what’s happening in the present, and live streaming is a highly effective way to engage your remote audience with that excitement. Applied to a brand or company, live streaming offers an authentic behind-the-scenes look at the people and philosophy that make you unique. As for our Duo in Space live stream, it was an unexpected success. The video reached more than 2,000 views within the first 48 hours, and it climbed to more than 5,000 views over the next two months. The live stream also serves as a great historical record of the challenges and successes for everyone involved in the project.